I am back with another book review. 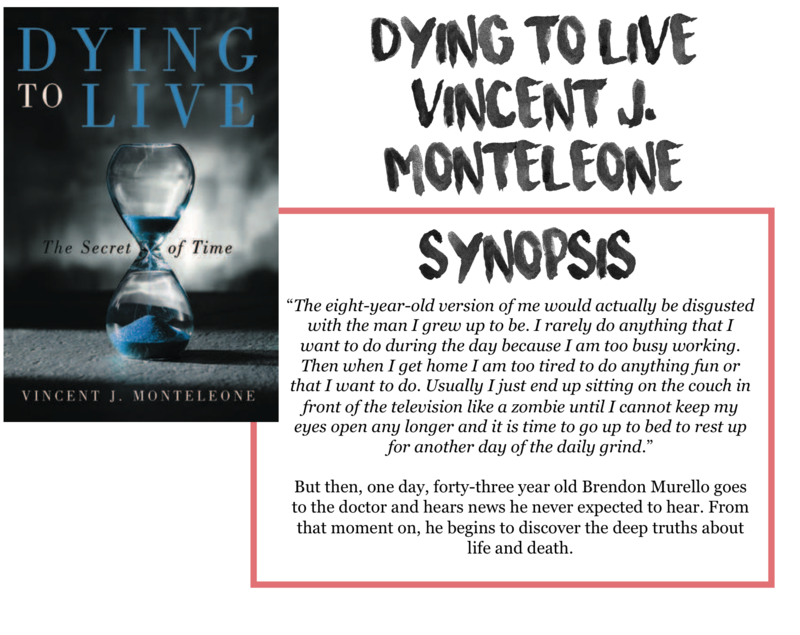 Today, I will be reviewing Dying to Live by Vincent J. Monteleone. Thanks so much to the author for sending me a copy of this book for an honest review. All opinions are my own. This was a very... different book for me. In terms of storyline and in terms of the way it is written. Basically, a man is diagnosed with stage four lung cancer, and given 6-18 months to live. He's 43. Premise wise, this book sounded interesting and it was, for the most part. Because the main character, Brendon, is a businessman/entrepreneur, a lot of the story deals with living to make money and how money isn't the most important thing, especially when you are given a diagnosis like his. There were some numbers and business references thrown throughout the book, but they weren't too advanced that they went over my head. This book also talked about choices in life, anything from falling in love to taking your kid to dance class or going to university to spending life making meaningful relationships. In that regard, I think this is a very important book for people of any age to read. Everyone struggles with wasting their time and focusing on the wrong things, and this book explores those issues and helps guide you to do what makes you happy, because at the end of the day, really, that's all you've got. This book was also different for me in terms of its style and how it is written. Everything is told in the past tense, so you get the feeling you are sitting on a park bench somewhere with Brendon while he tells you his story. It is only told from his perspective and you don't really feel a passage of time, there are a few references to time passing, but it just feels like you are an outsider being told a story. And in this case, I think the author pulled it off and it worked out beautifully. I really enjoyed the way everything was presented, although I feel like some people may have a hard time getting used to it, and being such a short book, may not enjoy it as much as I did. The main reason I am docking this book some stars is that while it is an important story, I felt like Brendon may not have been the best person to tell this story. I understand that he was set as such a wealthy individual to show that money can't buy happiness and even the rich aren't immune to catastrophe, but I just felt like his wealth was a little exaggerated. I think I would have preferred to hear the story from someone in a middle class bracket, who works just as hard and still makes a decent amount of money, but isn't able to pay for treatments like chemo or experimental drugs, like Brendon is. I think that the message still would have come across the same and Brendon could have been a little more relatable. That leads into another one of my issues with this book, I didn't really connect with any of the characters. Maybe it was just the perspective or the way it was written, but I felt detached from Brendon, and I didn't really care. Don't get me wrong, he's not an evil businessman or a corrupt multi-millionaire who deserved to die, but he's definitely not a person that I would say is easily relatable. I think perhaps the main issue I had in this book was the ending. I won't spoil anything but I just felt it was very anticlimactic and a little unbelievable. And not good unbelievable, like there's no way that can happen after stage four lung cancer unbelievable. And maybe I'm a little bitter and angry because I've lost so many people to less severe cancers, or maybe it's because of the disconnect I felt with Brendon, but I just didn't like how things ended. Overall, a solid book that has some good quotes and eye opening points that I think are important for people to read, but not a whole lot of connection to the characters, especially the main character.